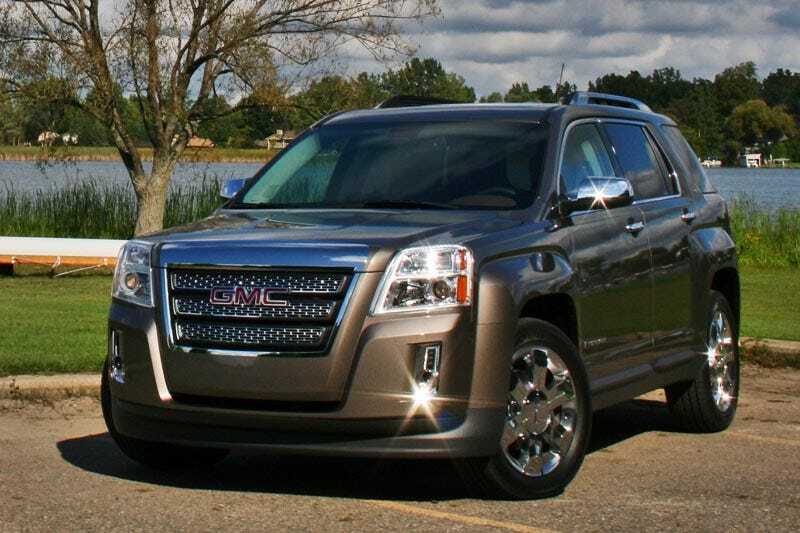 We were quite impressed with the 2010 Chevy Equinox on our first drive, but what about its platform-mate, the controversially-styled 2010 GMC Terrain? It's both more butch and expensive, but does it offer any substance over the Chevy? Not really. Let's get the lingering question out of the way: Is there any difference mechanically? In a word, no. The only difference as far as the vehicle is concerned is the suspension tuning required for the 19 inch wheels not available on the Equinox. Other than that the Equinox and Terrain are identical. Same engine packages: 2.4-liter four-cylinder engine with 182 HP mated to a six speed auto with an electric power steering rack and shockingly achievable 32 MPG; same 3.0 liter DI V6 good for 264 HP and mated to a six speed transmission, etc. The same all-wheel-drive system as the Equinox can be had with both engines. The options list includes leather, navigation, dual pop-up rear-seat DVD players, power programmable lift-gate, sunroof, a 40 gig hard drive, iPod integration, and 17, 18, or 19 inch wheels, based on trim level. Those big wheels are at the root of one of the only dynamic differences in the vehicle as well. Like the Equinox, the Terrain is competent over all road surfaces and handles well on corners of all shapes and sizes. Understeer is moderate when you overcook a corner, but if you're so inclined you can induce oversteer by lightening up the rear end with the brakes. Of course there won't be a lot of soccer moms hitting the track with this car, but in daily use it's just a little stiffer over bumps with the big wheels than the Equinox. Acceleration is the same; the 2.4 liter can squeal the tires off the line but loses pep through the mid range, though it's adequate for the vast majority of appliance drivers. The V6 does offer some decent grunt, but we'd be lying if we didn't want to see the 2.0 liter turbo Ecotec dropped in that engine bay. Since this is a GMC, we'd be remiss in leaving out the tow ratings of 1500 lbs and 3500 lbs for the I4 and V6, respectively fine for most weekend jobs, but bigger loads will require bigger trucks. Feeling the deja vu? You should. There's no equipment you can get on the Terrain that you can't get on the Equinox. What the Terrain offers has more to do with its personality. First and foremost is that exterior-that massive grille is the first full implementation of the new GMC face, first seen on the GMC Denali XT concept at last year's Chicago Auto Show. It's certainly polarizing, drawing equal parts love and hate, but it's definitely distinctive. The controversial styling extends down the sides as well, with extremely squared off wheel-well arches and pronounced, almost cartoonish fender flares. However, the side glass is something we think everyone can get behind, with sharp chrome surrounds giving the glass a clean, defined look. We have to admit to liking it when done up in the black with the 18 inch polished wheels, but the chrome wheels are a little much. Inside there's not much in the way of unique styling. The dash gets considerably higher-quality soft-touch material that's stitched together with nice contrasting red thread, complimented by the red accent and interior lighting, all differentiated from the blue of the Equinox. Seats are shared between both models, with the excellent mid-level cloth seats again taking the cake for comfort, grip, and styling. Rear seat passengers enjoy limo-like leg room with the sliding rear seat in he back position, and the bench is plenty comfortable for even the longest trips. There is a bit of news, as GM representatives let us know there was a Denali version coming along, so expect a garish front grille, a significantly upgraded interior with wood and aluminum trim, and unique wheels and exterior trim pieces. And that's kind of the modus operandi of the Terrain: appealing to a different buyer than the Equinox. Where the Chevy is sort of soft-looking and inoffensive, the Terrain is a louder, more look-at-me vehicle. It can be had with more chrome than any GM vehicle in recent memory, and decked out in a suit of black, it looks pretty dang sharp. Just because it might not be our flavor doesn't mean it won't find a strong audience of buyers. Add that it's base price is only $1800 higher than that of the Equinox primarily due to standard backup camera, floor mats, tint, fog lights, and USB integration, it's not that bad of a deal either. If this product came out first, we'd be shouting its merits as we did with the Equinox, but while it has everything which makes that product so good, it's only claim to fame is styling and a softer dash. The value proposition is still there, but the necessity is hard to argue. It's a great compact SUV, no question there. It's just not any greater than the Equinox.